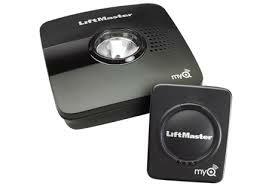 Access and control your garage door from anywhere at any time using your smartphone, tablet, or computer. Easily let a neighbor in when you’re away or check on the status to know if it is open so you can close it quickly. Get more from your garage door with custom automation that gives you the options you need. You can set a rule to receive an alert when the garage was opened, closed, or was left open. Automated triggers allow you to trigger other connected devices at home to interact with your garage – so you can have the lights turn on as soon as you open the garage door. You can also enable our exclusive Geo-services to use your location as a trigger to alert you if you left home without securing the garage. Receive a text or email alert letting you know that your garage door was left open after a certain amount of time so you can close it instantly. You can also receive a notification whenever the garage door is opened or closed to let you know who is entering and exiting your home. Monitoring your garage door keeps your family, home, valuable possessions secure by keeping you aware of open access to your home and giving you the control to fix it immediately.